I love when an author embeds a nonfiction text in a format that is unique, or interesting, or playful. 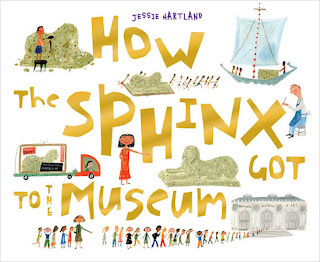 Jessie Hartland has done just that in CYBILS nominee HOW THE SPHINX GOT TO THE MUSEUM. Hartland's format makes the book especially unique. The left side of most two-page spreads is devoted to explaining the role each person played in restoring the Sphinx. The right hand side is a cumulative tale, which sounds a lot like THE HOUSE THAT JACK BUILT. Kids will love following the progression of the Sphinx, and rolling around in interesting words like curator and conservator. And I'm guessing that a lot of readers will be inspired to do further research on Egypt and sphinxes. Two pages of author's notes include additional information (facts, figures, and dates) about Hatshepsut, the Sphinx, and Eqyptology. Who better to tell the story of what a person is "really" like than that person's thirteen-year-old daughter? And that's exactly who is narrating Mark Twain's life in Barbara Kerley's THE EXTRAORDINARY MARK TWAIN: ACCORDING TO SUSY. Kerley has long wanted to write a biography of Mark Twain. Several years ago, she discovered that Twain's thirteen-year-old daughter, Susy, had already written one. 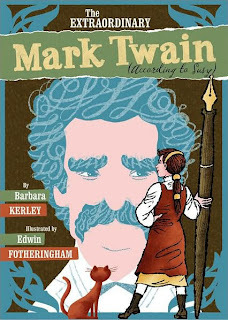 Kerley tracked that biography down, and incorporated large chunks of it into this delightful and very readable biography of Mark Twain. Susy reveals aspects of her father that only a daughter could know-- his love of cats and billiards, his difficulties with the family donkey, and his tendency to throw shirts that were missing buttons out the window. She also shares a number of details about his life as a writer- how he would write all day and sometimes into the night if things were going well, how his wife helped with revision and editing, and how his family was often his first audience. /golds and turquoise) and shape and especially line that are outstanding. I'm hoping for many, many more books from Fotheringham. It's really the design of this book, however, that will grab and hold a reader's attention. The book is relatively large- probably about 12"X 14". Approximately every other page, there is a much smaller (maybe 4"X 6") inset. The insets are Susy's journal entries, her original words, (complete with a few adolescent mispellings) done in a cursive-like font. I know kids are going to love these. Thanks to Jone (our fearless CYBILS nonfiction picture book leader) for hosting Poetry Friday at Check it Out. Ashley Bryan, according to the end page of his newest book, has created more than 35 children's books, 37 sea glass panels, dozens of puppets, hundreds of paintings and thousands of toasted cheese sandwiches. 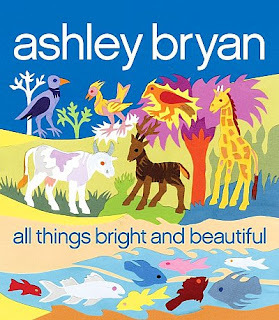 His most recent book is a cut-paper collage version of the much-loved hymn, ALL THINGS BRIGHT AND BEAUTIFUL. IT. IS. GORGEOUS. Each page is a glorious feast of color and line and image. You have to see it! Poetry Friday is at Random Noodling. POP! THE INVENTION OF BUBBLE GUM is just. plain. fun. From one set of pink gumball dotted end pages to the other, it's fun. 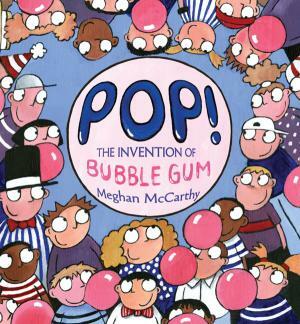 POP is the story of how Walter Diemer, an accountant at the Fleer Gum Factory in Philadelphia in the 1920's, invented bubble gum. It reads like a story. The characters in the illustrations, with their roundish, bubble gum shaped heads and round, bubble gum shaped eyes, add to the whimsy. A two page spread in the back includes a more extensive biography of Walter Diemer (Despite all of his gum chewing he still had all of his own teeth at age 85. And he married for the second time at 91!) There are also two bulleted lists of fun facts about gum (did you know that if you chew gum for a year straight you will lose eleven pounds!??) and a bibliography. You could use this book in a unit on inventions. Maybe pair it with last year's CYBILS nominee, THE DAY GLO BROTHERS. Or use it in a unit about perseverance. Or just read it aloud. Because this one is just. plain. fun. 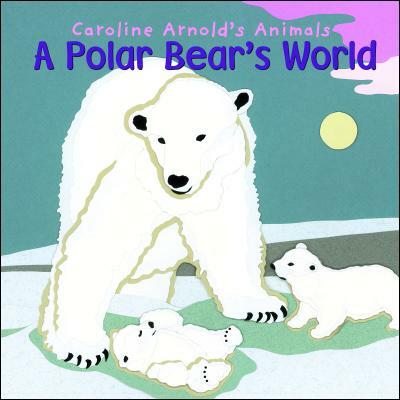 A POLAR BEAR'S WORLD is the latest addition to Caroline Arnold's Animal series. These books follow the life of an animal, in this case a polar bear, from the time it is born (actually in this book it follows the mama polar bear from the time she goes into the den to have her cubs) until the animal is an adult, able to take care of itself. The story is told as an engaging narrative. Each page also includes a small fact box that contains one interesting fact related to that particular page, e.g. Polar bears have such a good sense of smell that they can sniff a seal from twenty miles away. The illustrations in A POLAR BEAR'S WORLD are gorgeous, cut paper collages done in whites and grays and blues and purples, perfect for the Arctic setting. An added feature are the other arctic animals that are labeled in the background. Appendices include a map, fun facts, and a glossary, also a "To Learn More," and an index. A POLAR BEAR'S WORLD would be perfect for a unit on bears or arctic animals, or if you were trying to teach young readers about the features of nonfiction. It would also be a really nice mentor text for older writers- it's well-written, accurate, and a manageable length. This morning, I ran by the library to pick up some new CYBILS nominees. I noticed DANCING WITH MAX on the "New Books" shelf. And picked it up. And have not read many CYBILS books today. 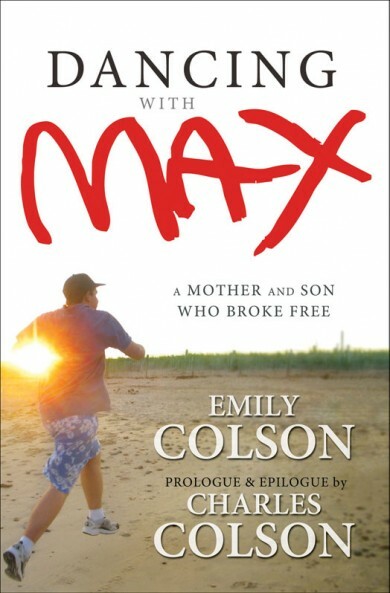 DANCING WITH MAX is by Emily Colson, daughter of Chuck Colson. Emily has a son, Max, who has autism. DANCING WITH MAX is a story about their lives. Max is a little quirky. He has been known to take his swimming trunks off in the pool. He loves to go to convenience stores to look at the refrigerators and other appliances. He removed the seats from an old Audi and placed them in his living room. But Max is also an incredibly pure hearted, loving, joyful soul. His mom, Emily, has done an amazing job capturing that joy, as well as some of the life/God lessons that she has learned in this book It's a really beautiful story- one that made me laugh and cry. It also really spoke to me about the nature of love and God and caring for each other. I want to buy it and read it again and underline parts that I loved. DISCLAIMER: This book is written by an Evangelical Christian and has a decidedly Christian bent. If that is uncomfortable for you, you might not enjoy this book, but I loved it. From "As American as Mango Pie"
as American as mango pie." Sonia's fingertips trace each word. Words in English have no meaning. And then a little later, "A Nuyorican Nancy Drew"
Sonia lends Junior her Casper and Archie comics. dreams of becoming a detective like Nancy. From the final poem in the book, "Who Am I?" On August 6, 2009, the Senate votes. In addition to the poems, this book has several great appendices- a more "traditional" prose biography, a glossary of the Spanish words, a timeline, and a bibliography. This is a book I would love to have in any intermediate grade/YA collection. First, it contains great information about a VIW (very important woman) in American history. The childhood events chosen by Bernier-Grand are engaging and would provide kids with places to connect with Sotomayor's life. Her childhood was difficult- she grew up poor, she was diagnosed with diabetes, her father died, she had to go to work at a young age-- this sounds a lot like the kids I teach. I could also see using this very unique format as a mentor text during a multi-genre autobiography or biography unit. At the beginning of the year, kids could identify key events from their own lives and write free verse poems, then create a time line, and maybe write a prose piece. Later in the year, they could research other people and develop a time line. From there, they could select key events and write short free verse poems. The time line and poems would give kids more experience and familiarity with the topic, and then they might be ready to write the prose pieces with more voice and originality than the "copying from books/cut and paste Wikipedia" report that often wanders into tweenish research projects. There is nothing better than a little poetry and nonfiction mixed! POETRY FRIDAY is here today. Most of what I am reading right now is nonfiction, and more specifically CYBILS nonfiction picture book nominees. Every once in a while, though, I feel the need to escape into a great story. And boy, oh boy, did I find a great one today! This is a book that works on a million different levels for me. First, it's a really nice piece of historical fiction. Charlie Anne's town is probably not unlike a million others of that era-- almost all of the men have gone north to find work, the women are at home struggling to maintain family farms and feed and clothe their families on almost nothing. Charlie Anne has two dresses- one that she wore to her mother's funeral, and the other out of an old feedsack. Her underwear is also made out of feedsacks. Mirabel feeds the family mostly from the garden. Vinegar pie is a huge delicacy. It's also a book about Civil Rights and race relations. Phoebe is the first black person that Charlie Anne has ever known. Many of the townspeople, sadly even at church, react very strongly to the young girl. Second, THE WONDER OF CHARLIE ANNE is a book about learning to read (a book about reading- can it get any better??!!?). Charlie Anne seems to have some kind of learning disability. Miss Moran, the town's previous teacher, has traumatized the young girl over her reading difficulties, making her do things like sit under the teacher's desk with spiders, stand in a trash can, and wait in a woodshed for the superintendent to beat her. Charlie Anne is terrified of school, but under Rosalyn's patient tutelage, things start to change. 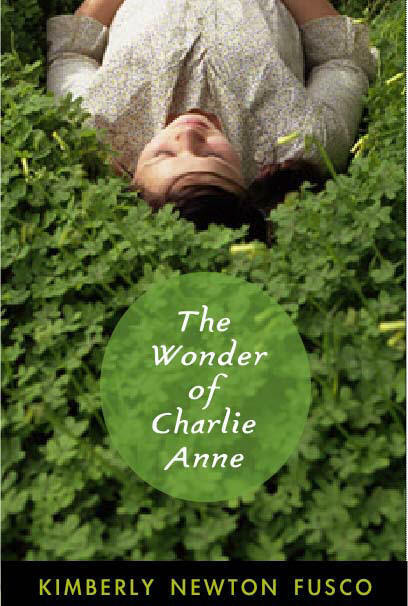 Third, Charlie Anne is a great character, plucky and tough. She would much rather be outside milking cows or measuring the corn than inside doing the million household chores that Cousin Mirabel has in mind. She's fascinated by Rosalyn and Phoebe, who are the first women that she has ever seen in pants. In Phoebe, Charlie Anne finds a kindred spirit and blood sister. At one point, Charlie Anne is gutsy enough to defend her friend in front of the entire congregation. 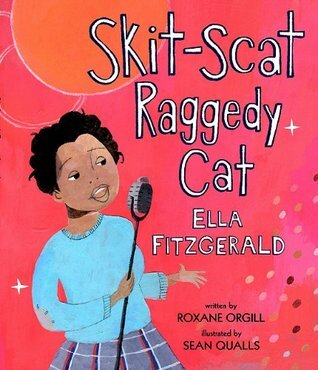 Ella Fitzgerald did not have an easy childhood. She lived with her mother, Tempie, and stepfather, Joe, until she was fourteen, then Tempie died suddenly, and Ella was sent to live with her Aunt Virgina, who "offered meals and a roof, and nothing more." Ella started skipping school and getting into trouble, and was sent upstate to a reform school where they "it was a regular routine to leave a girl in the basement, in chains, with nothing but bread and water." After two years, she ran away from the school, and ended up back in Harlem, where "people took her in and gave her a meal and a bed, or didn't…At the Baptist church, Ella got a pair of men's boots to keep the cold off her dancing feet." But Ella persevered. She won a spot at Amateur Night at the Apollo Theater. Heer voice cracked during her first few notes, and a kind emcee stepped to the microphone and said, "This young lady's got a gift she'd like to share with us tonight. She's just having a little trouble getting it out of the wrapper. Let's give her a second chance." Ella won first prize at that contest, but did not win the usual week with the band because of her raggedy appearance. Later, Ella won another amateur night at the Harlem Opera House. Soon, she found herself being introduced to Chick Webb. One of Webb's trombone players gave her a bar of soap, and told her to wash herself good. The costume mistress took a comb to her tangled hair every night. Soon, Webb and Fitzgerald's song, "A-Tisket, A-Tasket," was a number one hit on the radio. And after that, it was "so long, Skit-Skat Raggedy Cat. It's Rowdy-Dowdy High Hat Baby now." This picture book biography, with its colorful, predominantly red and blue illustrations by Sean Qualls, has much to say about persevering and overcoming odds. The text is a little long, so it's probably a better read for intermediate grades, or middle or high school. And it would probably be even more meaningful if kids could see this link to Ella Fitzgerald singing A-Tisket, A-Tasket, or check out Fitzgerald's official website here. "Henry Aaron had a dream. He wanted to be a big-league baseball player. or whatever he could find. Henry Aaron grew up in Mobile, Alabama, where blacks didn't even have a ball park until Henry was 12. He was a skinny kid who held his bat the wrong way. Even after he made it to the minor leagues, Henry faced tremendous adversity. White fans booed him and called him n------. Pitchers threw fastballs at his head. When his team won the pennant, Henry's team had a party at a restaurant in Savannah, Georgia. Henry and two other black teammates spent the evening in the kitchen playing cards. A terrific read about pursuing dreams, working hard, persevering, and overcoming adversity. And Matt Tavares' illustrations are drop dead gorgeous- rich and detailed. 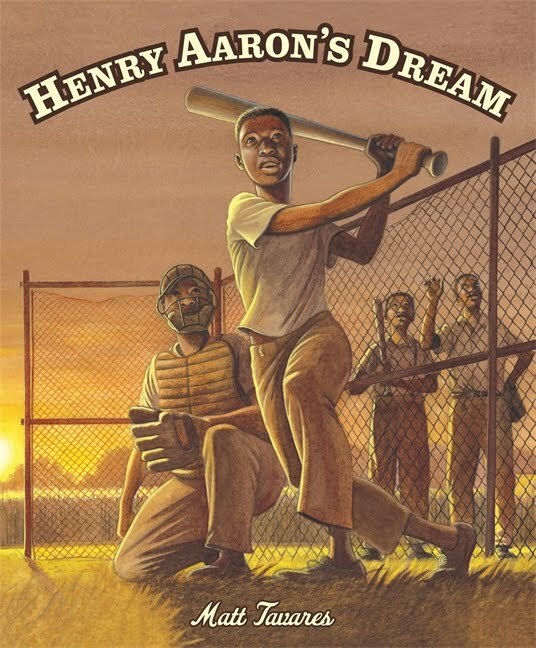 For some really interesting information about Matt Tavares' research and illustration process for HENRY AARON'S DREAM, check this page from his website. 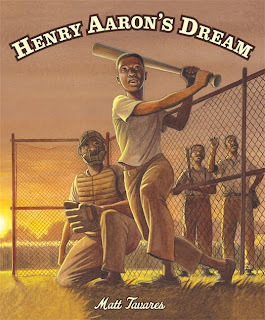 Pair HENRY AARON'S DREAM with Kadir Nelson's WE ARE THE SHIP, then TEAMMATES. Appendices include a page of author's notes, also a chart of Aaron's baseball statistics. 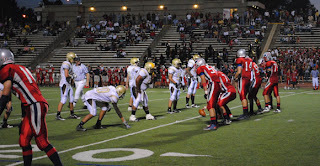 I've taught in urban schools for almost thirty years. And while I love, love, love what I do, and would never want to be anywhere else, some days are just down right hard. There are days, lots of them, when I think, "I do not want to hear another story about someone's mom going to jail. I do not want to look at another child and wonder whether we can find someone to donate a coat. I do not want to comfort another child who needs a mommy far more than they need a teacher." Days like that, I need to surround myself with books that help me to believe and to hang on. Books about people who have made it in spite of seemingly insurmountable odds. OPRAH: THE LITTLE SPEAKER is one of those books. 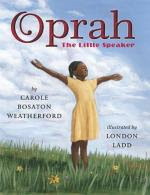 This picture book biography by noted children's author Carole Boston Weatherford details the life of Oprah Winfrey. But not her life as a talk show hostess. Or magazine editor. Or actress. Instead, it tells the story of Oprah's growing up years on her grandparents' pig farm. The family did not have indoor plumbing. Oprah did not have a bed of her own. She wore shoes only on Sundays. But she had a grandma who told her she could be anything she wanted to be. Who taught her to read and write. And prayed and believed that God had big plans for her. My students need to read lots of books like this. SAVAGE SAFARI is a visual smorgasboard that I think kids are going to love. Each two page spread features a different African animal. There's a large photograph, labelled with the animal's salient features and a paragraph of information. Then there's a silhouette drawing with length, height and weight. And a scale that rates the animal on characteristics such as intelligence, speed, agility, and evasion techniques. A small map shows where in Africa the animal lives. There's a "card" that features the animal's allies and enemies. Another area on the page features the animal's superpowers (a hippo, for example, can bite with one ton of pressure), its equipment (the hippo not only has large size, but also has aqua-adapted skin, ears, and feet), its weaknesses (that same hippo has thin skin that dries out, so it has to stay close to water), and an interesting fact (the hippo can stay underwater for up to five minutes). As an added feature, two pages in the back combine the features of various animals to create the "Ultimate Predator" and "Ultimate Defender." And there's an extensive glossary. Hand this gem to one of your video game loving, book hating kiddos- it's a sure winner! 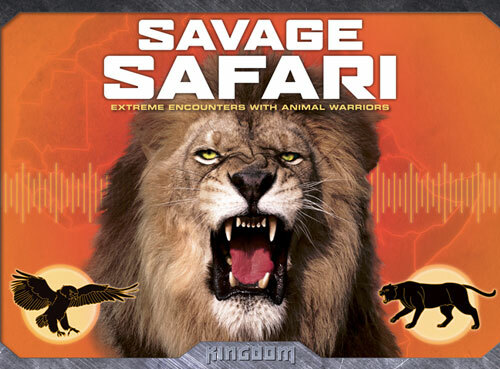 A story from today: I threw SAVAGE SAFARI into my teacher bag this morning. 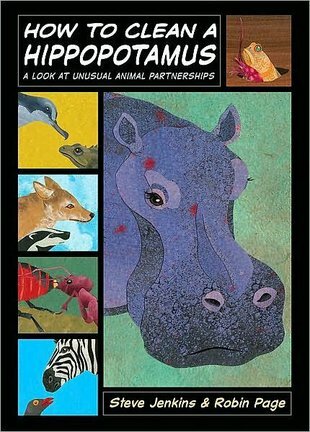 The fourth grade is doing a unit on nonfiction, and I wanted to share this book, with all of its interesting text features, with them. I also thought of a couple of kids that are having trouble engaging during independent reading time and thought this book would hold their interest for a little while. I shared the book during the mini-lesson, then watched as it made the rounds during class. At the end of our literacy block, one of our ELL students approached me. This little guy is one of the kids that keeps me awake at night. His English isn't progressing as quickly as I would like it to, he isn't particularly engaged with school, and seems to be out sick pretty regularly. "Where did you get that book?" he asked. I showed him the library sticker on the front of the book and told him that I had gotten it at the library in my neighborhood (which is not very far from the school). Thirty seconds later he was back. "Can you write down where that is?" he asked. By this time, we were standing in the hall as the kids headed off to specials. "Sure," I replied. "As soon as I get back to my office, I'll write it down and bring it to you." Soon, he was back again. This time he held a slightly rumpled piece of notebook paper and a stubby pencil. "Can you write it down now?" with more than a little urgency in his voice. As I said yesterday, Steve Jenkins and Robin Page write some of my favorite kids' nonfiction. Their books are engaging, factually accurate, and full, full, full of fascinating illustrations. It doesn't surprise me then, that Jenkins and/or Jenkins and Page are the author/illustrators of three books on the CYBILS nonfiction picture book list. Yesterday, I reviewed HOW DO YOU CLEAN A HIPPOPOTAMUS? 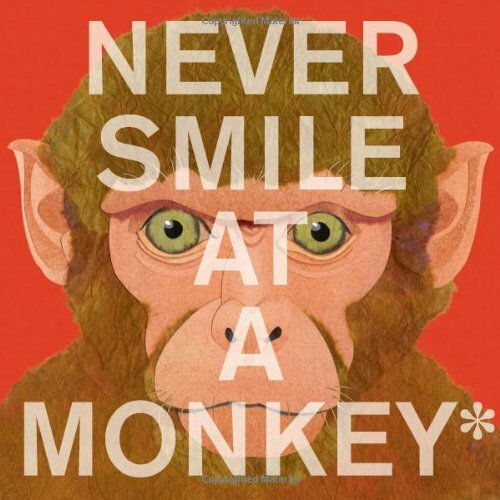 Today, it's NEVER SMILE AT A MONKEY a book I would describe as "typical" Steve Jenkins, (if there is such a thing). Each page or two-page spread features one of Jenkins' beautiful cut/torn paper collage illustrations. Somewhere on the page, there's also an admonition, done in a large font. Accompanying that is a paragraph of more detailed explanation. 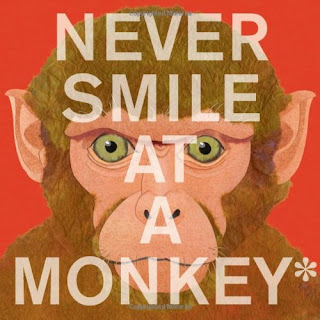 You never smile at a monkey, for example, because they might take the show of teeth as a display of aggression and respond in similar fashion. You should also never bother a blue ringed octopus, collect a cone shell, pet a platypus, or harass a hippopotamus. Using seventeen different examples, Jenkins explains how different animals have adapted for survival in their environment. Jenkins' newest title, BONES, about "skeletons and how they work" is also nominated for this year's CYBILS. I gotta tell you, I. LOVE. THIS. BOOK. Each two page spread compares a different aspect of the human skeletal system to that of several animals. I loved, loved, loved the foldout spread of the python's ribcage (Jenkins' meticulous attention to detail and accuracy is so evident in this illustration-- this particular python was a six footer with 200 hundred pairs of ribs, but larger pythons can have up to 400 pairs). I also loved the skull page- this foldout featured actual-sized skulls of eleven different species, including a human, a green turtle, a butterfly fish, and a tree shrew. Four pages of appendices are newspaperish articles about bone related topics. The illustrations in this book are over the top terrific. The background of each page is solid colored, with bones that are mottled whites, grays, and tans. Each page tells how the skeleton compares to actual sized bones. 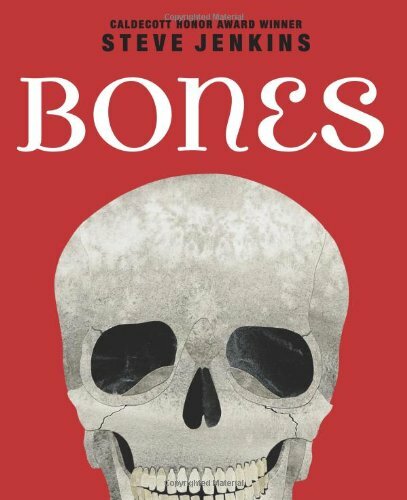 And there's even a bit of humor- check out the page where a rhino skeleton chases a human, or the last page, where a human skeleton is waving goodbye. This book is my nominee for the Caldecott! 1) The book will be jammed full of interesting information, the kind of knockout nonfiction that children revisit again and again. 2) The research will be solid and thoughtful. There will be appendices with additional information. 3) The artwork will be gorgeous torn/cut paper collage. There is often a clever twist in the book design, e.g. the depth meter along the right hand side of each page in DOWN, DOWN, DOWN (one of last year's CYBILS awards finalists). 4) I will find myself asking, "How did they get interested in this topic? And where in the world did they find all this bizarre information?" Zebras, wildebeests, and ostriches often graze together on the African plains. Zebras have excellent hearing, wildebeests have an acute sense of smell, and ostriches have great eyesight. They work together to help defend themselves against predators. Coyotes and badgers hunt prairie dogs together. The coyote leads the badger to a prairie dog burrow. The badger digs at the front door, and the panicked prairie dogs attempt to flee out the back, where the hungry coyote is waiting. They return to the front, where they are confronted again by Mr. Badger. The clownfish hides from its enemies among the stinging tentacles of a sea anemone. The toxin of the anemone, however, is very poisonous, and the clownfish must build up its immunity to this toxin by gradually brushing against the tentacles. If the clownfish leaves its safe haven for more than 45 minutes, it has to start all over again. And it is not immune to the toxin of all sea anemones, only one. The artwork in HOW TO CLEAN A HIPPOPOTAMUS is, as expected in a Jenkins and Page offering, is gorgeous cut/torn paper collage. But instead of one or two animals per spread, each page in this book consists of a series of panels, almost like those found in comic books. And the layout is different on each page. I spent at least five minutes exploring each two-page spread, then went back to look at some again. I know the illustrations will hold this same fascination for kids. I'm thinking right now about whether I might have kids use the book as a mentor text for "visual reports" when they do research. Steve Jenkins has a terrific website. I especially loved the section about how he researches and creates his books. Check that out here. Another winner by Jenkins and Page! 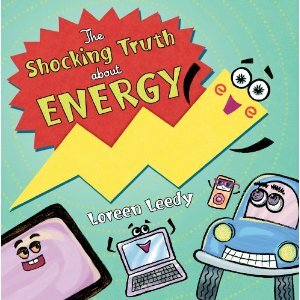 I wish I would have had THE SHOCKING TRUTH ABOUT ENERGY. It's chock full of great information, and would have been really helpful in talking with my friend, the solar scientist. Each two page spread in this book focuses on a different type of energy-- muscle power, fossil fuels, hydroelectric power, solar power, wind power, water power, and even plant power. Cartoon-like illustrations, complete with talking appliances, explain how that particular type of power is generated, and also detail positive and negatives. The final few pages are devoted to spelling out how children can do their part in saving energy and keeping the world green. Three pages of detailed authors' notes give additional information about the topic. A really nice resource for a science classroom! OK, so I'm probably not supposed to admit this, but I really do like hot dogs. Especially cooked on the grill, until they are a little charred. Or at baseball games. Just the hot dog, and the bun, and mustard, and once in a while a little pickle relish. No catsup or weird stuff like sauerkraut or onions. It was fun, then, to discover Adrienne Sylver's HOT DIGGITY DOG in my pile of CYBILS nominees this week. Sylver became interested in hot dogs after hearing a show on NPR one July weekend. Did you know that Americans eat two billion hot dogs every July? Or that if you lined them up end to end, they would stretch 190,00o miles. 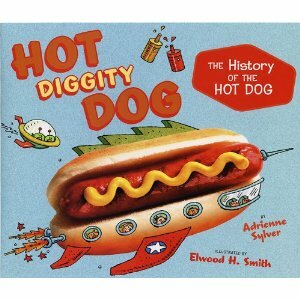 After hearing the NPR show, Sylver began researching the history of the hot dog. Each two page spread is a kind of "mini-chapter" e.g. "In the Beginning," "Welcome to the USA," "The Hot Dog Farm," and "Extreme Eating." There's a paragraph or two about the topic, then a side bar with three or four related facts. Did you know, for instance, that you can order a Salmon Dog, topped with avocados and carrots at Franktitude in Miami, Florida? 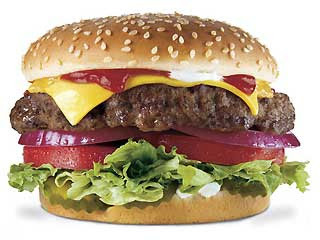 Or that Babe Ruth loved hot dogs so much that he would often eat more than a dozen in one sitting? The illustrations are mostly cartoon, but occasionally a photograph of a hot dog sneaks its way in. Appendixes include two hot dog recipes, some interesting food-related websites and books, and a bibliography. Then several pages later, a refrain that repeats throughout the book. The compact text is accompanied by really nice collage illustrations, created by Ashley Wolff, best known for the Miss Bindergarten series. 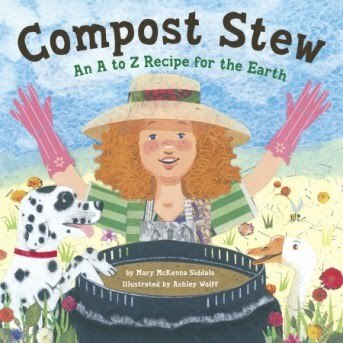 This is a book I might use with young children in a unit on caring for the earth. I might also use it to talk with older children about interesting alphabet books or in a unit on collage illustrations.